After weeks of online tournaments hosted by both ESL and 343 Industries, the last LAN event, hosted by Pro Gaming League [PGL], comes to an end with Evil Geniuses pulling yet another win this season over CLG! Hosted in the city of Indianapolis, and within the halls of Indy PopCon convention, the $50,000 prize bracket was broken up among the top 8 teams, with first place receiving $20,000! After arriving to the convention hall a few hours late, the event was well under way with teams advancing in the bracket or ending their run after a mere quick double elimination. I arrived to catch Winterfox send Swarm to the losers bracket after a tough series, and a 2 – 1 win on the main stage. As the day progressed, I was able to catch quite a few more matches, both in the winners, and losers bracket, all showing an exceptionally high level of halo gameplay unseen in many other tournaments. The first match of Saturday was that of Round 4 of the winner’s bracket, between Evil Geniuses and Noble eSports. While both teams fought extremely hard to move forward, EG takes a decisive 3 – 0 series win and sends Noble to their losers run. The day continued with a few notable series, such as the Winterfox vs. Optic match, being the last series of Round 4 winner’s bracket. After a hard fight back and forth between these teams, Optic beats out Winterfox just barely with a 3 – 2 win in the series. The day continued, and Round 5 of the winner’s bracket was finished to push both Evil Geniuses and Denial eSports to the winners final. The rest of the day consisted of the loser’s bracket, progressing to allow CLG and Winterfox to play in the last match of the day, in loser’s bracket Round 8. Both of these teams were heavily matched in skill, but after a grueling series, CLG took the win 3 – 2 over Winterfox. 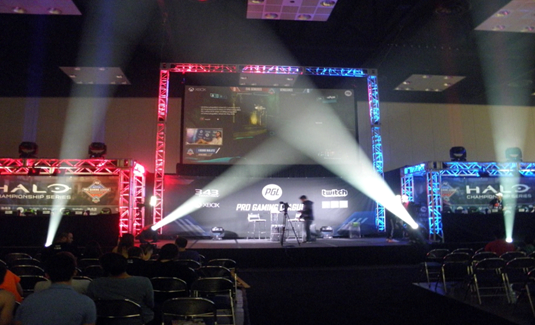 June 28th, the last day of HCS Indy, and the last day of Indy PopCon. I ended up arriving around 10 am, at the opening of the convention, to check out the floor hall and grab a few pictures of the event before anybody arrived with its start at 12 pm. 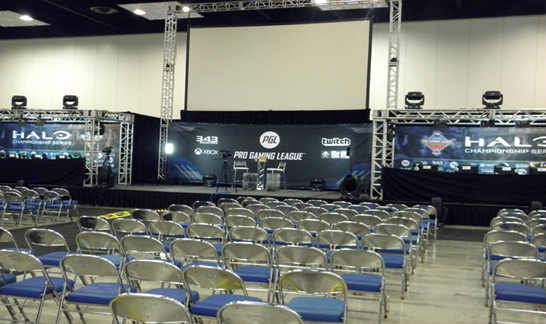 Today, only 3 teams remained, and only phenomenal halo was to be seen on the main stage. To start off the day, Denial was to play Evil Geniuses in the winner’s final, with the winner progressing to the grand finale, and the loser to play CLG for the remaining spot. Like much of the Halo seen this weekend, the winner’s final consisted of some of the better Halo seen nowhere else, allowing Denial eSports to show everyone that Evil Geniuses are not unbeatable, allowing for themselves to win the first two games against EG all weekend. While Denial was strong enough to take the first game wins over EG during the event, they weren’t strong enough to take the series, losing 3 – 2. This put Evil Geniuses as the first team in the grand finale. The next series to be played was between Denial and CLG, pitting two amazing teams against each other in the loser’s final bracket. After a grueling and competitive match-up, CLG barely pulled ahead to win the series 3 – 2 and knock out Denial from the event. The grand finale was set, and CLG and Evil Geniuses were to duke it out for the $20,000 prize of first place! After the grand finale of these two amazing teams and organisations, Evil Geniuses took the series win over CLG 3 – 1, putting an end to HCS Indy and setting the final bracket for championships of Season 2.
Who am I and what was I doing at this event? Hi, I’m Lars Olson, 17, and I am one of the many social media managers here at VwS. Located here in Indianapolis, Indiana, the event was a mere 20 minutes away, and so I attended to both communicate with fans, update social media about the bracket, and take photography for the organisation. I’d like to personally thank the ReadyUpLive.com crew [And Unyshek] with their hospitality in allowing myself to hang with them during the weekend. I’d also like to thank 343 Industries, PGL, and Indy PopCon for one of the better hosted events of Halo I’ve been to in a while. Finally, while I may have been at the event for Halo, I was able to take a chance in playing a new game on the floor of Indy PopCon, called “All Things Go Boom” created by the studio, Double bomb Games; great fun was had!